Xiaomi recently launched Redmi Note 7 in China with a waterdrop (also known as dewdrop) notch display. The glass look body with gradient color combination, dual rear cameras, and a dual tone LED flash gives a premium look and design overall. The handset is running on MIUI 10 based on latest Android 9.0 Pie out-of-the-box. As we all know that all Xiaomi Mi and Redmi series phones are capable of unlocking the bootloader, installing TWRP and Root very easily by just doing some simple steps. There are so many custom ROMs available for most of the Xiaomi Redmi devices. 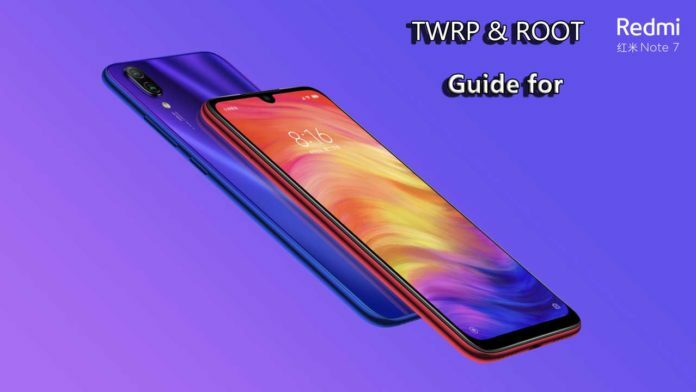 Here in this guide, we will talk about How To Install TWRP Recovery and Root Redmi Note 7. Team Win Recovery Project (TWRP) is the well-known open-source software custom recovery extension for Android devices. It gives the touch-screen enabled user interface with lots of customizations and tweaks. TWRP Recovery allows you to install custom ROMs and other modules on your Android device easily by flashing (.zip) files. You can Root or Unroot your Android device easily. Enable root access on your Android phone by flashing the Magisk via TWRP Recovery. Can flash custom ROMs, MODs, Kernel etc. It allows you to install Xposed Firmware. You can also create a backup file of your Android data, system, and restore at any time. gadgetheadline.com won’t be responsible for any kind damage or issue occurs to your Xiaomi device. Please do it at your own risk. First, make sure to keep all the necessary files and drivers like USB driver, ADB & Fastboot tool installed on your PC. Make sure to take a complete backup of your device before start anything. Keep your smartphone battery juice at least 50%-60%. So it doesn’t get turned off during the flashing process. Make sure that you have successfully unlocked the Bootloader of Redmi Note 7. 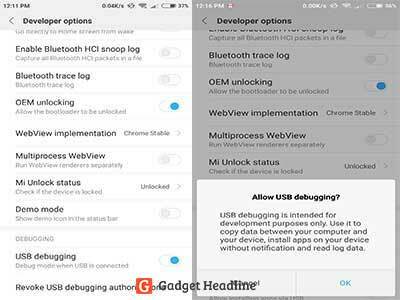 You have to enable the ‘USB Debugging’ and ‘OEM Unlocking’ option from your phone settings. Can install compatible Custom ROMs on your Xiaomi Redmi Note 7. You will be able to upgrade your custom ROM to the latest Android Q version via TWRP. You will be able to Root your Redmi Note 7 device easily by TWRP without any PC. Can be able to flash any Custom Recovery files or restore any backup file via TWRP Recovery. Flashing wrong via TWRP Recovery method can brick/bootloop your Android phone. However, you can easily flash your Stock ROM again via Mi Flash Tool (.exe) application using the Fastboot Method. Flashing a Custom ROM or bricking your device isn’t permissible officially. It can void your device warranty. If you don’t know what you’re doing, then it’s highly recommended to skip this guide. Most of us want to use other Custom ROMs available in the market for our specific device model. In order to do that we need to unlock our device bootloader and sometimes Rooting also. Rooting is the process to allow the Android device user to take control of default Android Settings. It gives you the access to Android System Codes and all the customizations that change the look and design of the interface, settings, and any other tweaks. This gives you more power of user experience. It allows you to install any Custom ROMs on your device(s) which is compatible with your Android version and model number. Capable of installing compatible Custom ROMs easily. Can change/add/edit System Interface and settings options. Allows you to flash modded (.zip) files. Can install MODs, Kernel version as well. Allows you to uninstall system apps and games which are preloaded (Bloatware). Go to device ‘Settings’ > ‘About Phone’ > tap 7 times on the MIUI Version and it will turn on the ‘Developer Options’. Back to the main Settings menu again > Additional Settings > Developer Options > turn on Developer Options > enable USB Debugging and OEM Unlocking. Enable Advanced Reboot option as well. First, install ADB and Fastboot driver on your PC. Copy the downloaded SuperSu (.zip) and TWRP (.img) file on your device internal storage. Now connect your device to Windows PC/Laptop via USB cable. 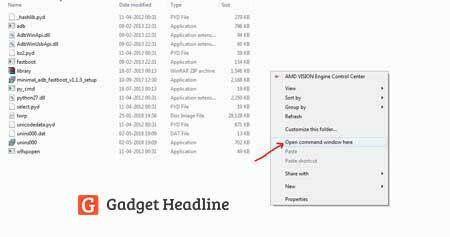 Open Command window from the installed ADB folder (Local Disk C) by pressing and hold Shift + Right Mouse button together. Now you can easily Root your Redmi Note 7 smartphone by flashing the SuperSU.zip file from where you copied image file and SuperSU.zip file earlier. This method is highly recommended for all technical or non-technical users. After the successfully booted into TWRP mode go to Install option. Choose internal memory > find the downloaded SuperSU.zip file and select it. Swipe to confirm flash and wait for a few seconds. You’re done. Happy rooting with TWRP. Hope you understand the guide and successfully installed TWRP and Root on your Xiaomi Redmi Note 7. If you have any doubts, feel free to ask in the comments below.